Liberty Hill, Texas (Ammoland.com) – The first annual Texas International Firearms Festival (TIFF) is going great guns! Exhibitors to the two-day “come and shoot it” event (November 8th and 9th at Best of the West Shooting Sports in Austin Texas) now include Advanced Armament Corporation, ArmaLite, Beretta, Barrett, FNH, Henry Repeating Rifles, Lapua, McMillan Firearms, Noveske, SIG SAUER, Springfield Armory, Slide Fire, SilencerCo, Silencer Shop, TrackingPoint, Underground Tactical and Winchester Ammunition. With more to follow! Anyone buying a ticket to the Texas International Firearms Festival before September 15 could win an Underground Tactical rifle. And not just any Underground Tactical rifle but a $2,200.00 ultra-light “Bacon Maker” chambered in 300 AAC Blackout. The rifle’s equipped with a 416 stainless steel 5R barrel, Geissele two-stage trigger, KNS non-rotating pins, Tungsten Cerakote finish, Magpul CTR stock, MOE grip and enlarged trigger guard, Underground Tactical charging handle and 12″ MCSR VII Keymod rail. The finishing touch is a laser-etched Texas International Firearms Festival logo on the receiver. 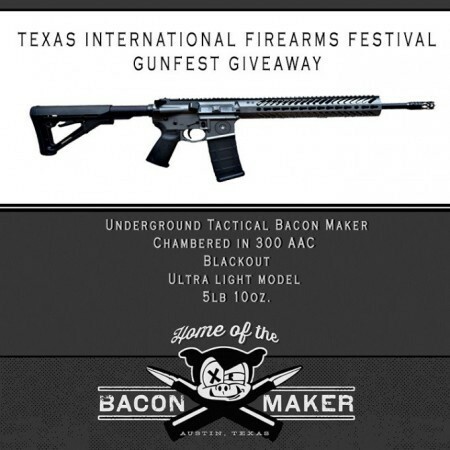 Anyone who buys a ticket to the Texas International Firearms Festival before September 15 is automatically entered into a random drawing for the Underground Tactical Ultra-Light Bacon Maker. The winner will be announced on TIFF’s Facebook, Instagram and Twitter pages and notified by email. Good luck and see you in Texas!